In the Downton Abbey Christmas episode we saw Lady Edith revisit what Laura Carmichael calls, “the Strallan idea.” In spite of what her father thinks of his age, Sir Anthony Strallan is marriage material. He has to be: Edith isn’t in the mood for any more dilly-dallying. As ever with Edith, driving all of this is her relationship with her sisters, fractious as ever. Robert, naturally, thinks this is all a terrible idea. But it becomes Edith’s prime focus – because in truth, Carmichael says, she’s bored. She misses the war. 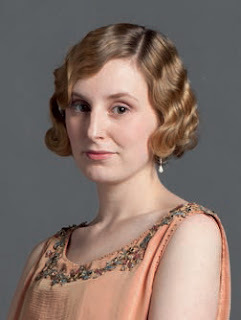 Edith wants to do more, in short, and it will take her outside Downton Abbey for the first time. Carmichael says that what she admires about Julian Fellowes’s writing is his ability to keep so many plot strands in play. So the Grantham sisters’ past clashes continue to fester. This year Carmichael has had a chance to enjoy Downton Abbey’s growing global reputation. In May she and Michelle Dockery went to New York for the Met Ball, the fashion industry’s ‘night of nights’. She needs little prompting to recall this season’s highlight. Very disappointed in the episode with Sir Anthony and his jilting of Lady Edith at the altar. It is also very difficult to believe a man of his stature would ever do this to begin with. I could believe he would change his mind, but only well before wedding plans were made. I cannot believe a man with his integrity would do this to a woman. What are the writers in this script doing? If Maggie had interfered forcefully, the character of Sir Anthony would cancel the wedding, but he wouldn't have just walked out like that. This was a horrible show, and the only saving grace at all that came out of it was that Laura Carmichael really gave a stunning performance!